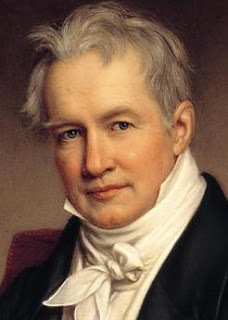 Alexander von Humboldt was a German natural scientist, archaeologist, explorer and geographer, who made two major expeditions to Latin America (1799-1804) and to Asia (1829). During the first, equipped with the best scientific instruments of the time, he surveyed and collected geological, zoological, botanical, and ethnographic specimens, including over 60,000 rare or new tropical plants. He charted and made observations on a cold ocean current along the Peruvian coast, now named the Humboldt Current. In geology he made pioneering observations of stratigraphy, structure and geomorphology and he understood the connections between volcanism and earthquakes. Humboldt also named the Jurassic System. He died on this day, May 6th, in 1859 aged 89. For more information on the life and works of Alexander von Humboldt click here.